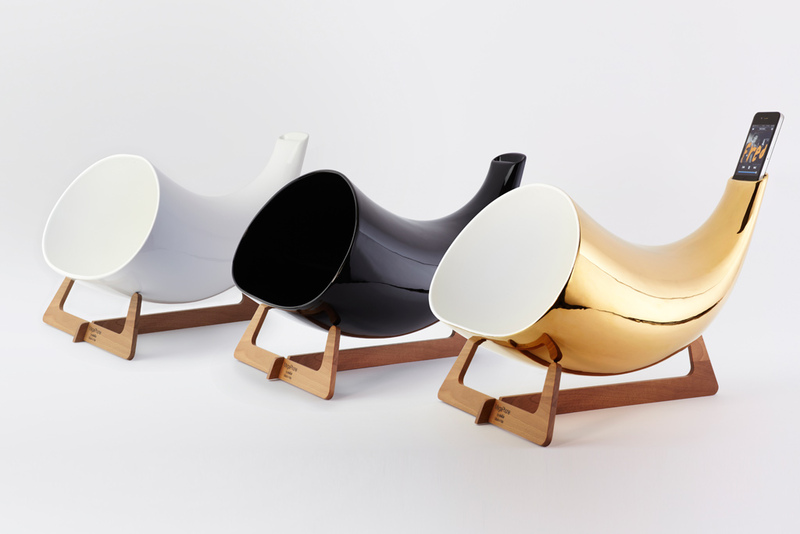 Italian design company en&is has manufactured a ceramic passive megaphone to use with your iPhone to amplify its sound. If you want to avoid the raft of powered iPhone speaker docks and are looking for something just that little bit different, this could be for you. The horn like design sits on a thin wooden frame which allows it to float off the table to optimize the sound experience. The iPhone slips into the top of the horn and all you need to do is press play. The megaphone will then passively amplify the sound into the room. It can also be used as a speakerphone if you so wish. The Megaphone is available in three colors, black, white and gold. The black and white models cost €399 ($540) and the gold comes in at a whopping €599 ($810). It works with every iPhone available and also with the iPod touch if you have it in a case. There is no doubting that this would make a beautiful addition to your living room. Unfortunately with no way to control the volume or actually charge your device, it is a little limiting.